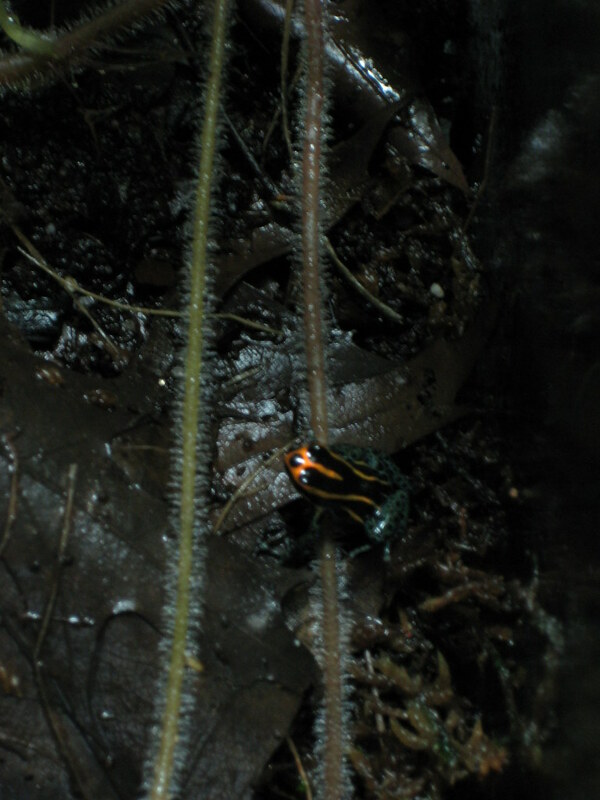 My little breeding colony of Dendrobates ventrimaculatus “Iquitos Red” is getting a bit bolder – yesterday I saw 3 of the 4 frogs out in the open. Unheard of! Today I managed to grab the camera and snap a shot of one before he disappeared into the undergrowth. Apologies for the quality – speed was of the essence – it really is a point and shoot picture. Just to allay any concerns if you clicked though and read “Conservation status: Extensive captive breeding in the US and Europe has greatly decreased the demand for smuggled specimens, with the possible exception of the red and orange Iquitos morphs…” – these guys are first US-born generation from a captive breeding operation in Peru and carry registration numbers so that froggers can keep accurate records. This entry was posted in creatures by dr.hypercube. Bookmark the permalink.